You have probably had bamboo shoots in a delicious stir fry or even in a nice steaming bowl of hot and sour soup. They add a delightful crunch, but they are hardly thought about in the grand scheme of things. However, as it turns out, bamboo shoots have great health benefits, such as providing a great source of fiber and boosting the immune system. The next time you are enjoying Asian cuisine, you might want to pay more attention to these crunchy little bean sprouts. 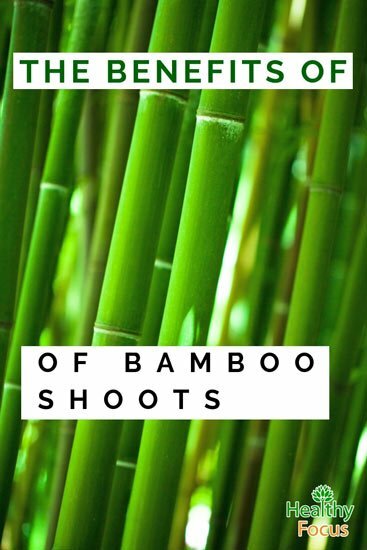 Bamboo shoots are little sprouts that spring up adjacent to the bamboo plant. One of the fastest growing plants in the world, bamboo can grow up 100 cm a day, helping to give its reputation of being the tallest in the grass family. The bamboo plant is popular in Asian cultures, where every single part of the plant is utilized. You may have heard of bamboo being used to make furniture, houses, floor mats, and even musical instruments. Bamboo shoots are commonly incorporated in Asian cuisine. You can either purchase fresh bamboo shoots or canned. When storing fresh bamboo shoots, be sure to store them in a cool, dry place. Fresh bamboo shoots left out in the sunlight develop an unpleasant bitter taste. Canned bamboo shoots have a considerably longer shelf life. Vitamin A: Essential to eye health and bone development. Vitamin A also ensures strong teeth and bones, while keeping your skin soft and moisturized. Vitamin B6: Vitamin B6 stimulates the metabolism while boosting the immune system. Vitamin B6 is also for regulating hormones and helping to maintain emotional stability. Thiamine: Thiamine maintains a healthy immune system while helping to ensure the health of your heart. Thiamine also increases energy production and protects the nerves by helping them to develop strong myelin sheaths. Riboflavin: Riboflavin provides your body with a significant amount of energy. It also aids in the production of red blood cells and encourages the development of healthy tissues and organs. Niacin: Niacin is essential because it helps to lower LDL cholesterol and assists the digestive system in absorbing carbohydrates. Niacin also improves blood circulation and encourages sharp cognitive functioning. Folate: Folate is important for preventing birth defects. Pantothenic Acid: Pantothenic acid helps to reduce stress and helps to maintain heart health by regulating blood pressure and decreasing LDL cholesterol. Vitamin E: Vitamin E has long been revered for its ability to strengthen and maintain skin, hair, and nail health. Calcium: Calcium is vital to your health, as it helps to maintain strong and healthy teeth, bones, muscles, and nerves. Magnesium: Magnesium ensures normal nerve and muscle function. Magnesium also helps to regulate blood pressure and blood sugar levels. Potassium: Potassium helps to protect your cardiovascular system by regulating blood pressure and preventing strokes and heart attacks. Iron: Iron is vital to red blood cell formation and hemoglobin, helping to prevent the onset of anemia. Bamboo shoots are also a rich source of such minerals as zinc, phosphorus, copper, manganese, sodium, and selenium. Bamboo shoots are also a rich source of fiber and amino acids. 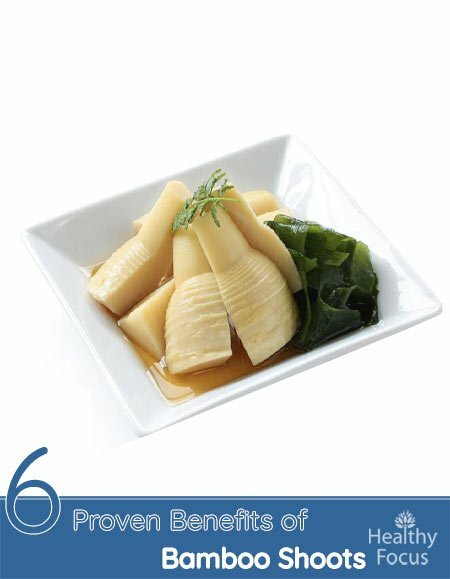 Do to its incredibly rich content of vitamins and minerals, bamboo shoots offer considerable health benefits. Bamboo shoots may help to protect the cardiovascular systems by helping to regulate blood pressure due to its rich mineral content, particularly potassium, magnesium, niacin, and pantothenic acid. Consuming bamboo shoots can help you decrease levels of LDL cholesterol. The high fiber content of this sprout keeps the arteries clear while preventing the development of atherosclerosis. By keeping the blood vessels clear of plaque, blood is able to easily flow to and from the heart, decreasing the pressure placed on your heart and preventing the onset of heart attacks and strokes. Boasting a high vitamin and mineral content, bamboo shoots may help to fortify the immune system. A rich source of vitamin C, regularly consuming bamboo shoots may help to protect your body from infection and illness. High in fiber, bamboo shoots can help keep the digestive system running smoothly and efficiently. Fiber helps to add bulk to stool, encouraging regular, healthy bowel movements and preventing constipation. Getting enough fiber in the diet also helps to prevent diarrhea by adding bulk to the stools and preventing the loss of vital nutrients. If you are trying to put together a healthy diet low in fat, consider adding bamboo shoots to the mix. While rich in nutrients, vitamins, and minerals, bamboo shoots are low in calories, yet help to fill you up.